If you have an old tablet lying in your cupboard or is simply surplus to your requirements as you have upgraded to a newer model, then don’t throw your old tablet in the bin. In fact, turn it into cash. And to do so, you have to sell it. Selling your tablet for a good financial return is as easy as selling your old smartphone or any other gadget. And to make the most money out of your tablet, you have to do a little groundwork. You should exactly know what is your old slate’s worth, where to sell it and how to sell it. How Much Your Old Tablet Is Worth? The price of your old tablet depends on the condition of the tablet. By condition we mean, it’s hardware and software. Your tablet’s size, power, RAM, build, processor and other things determine the price tag. If you have an old tablet that you bought around £200 a few years ago, then it will not get you a great deal but if you have a newer model to sell then you might get a handsome amount in return. In the tech market, Apple tablets have the highest value compared to its rivals. From Samsung Tabs to Apple iPads, there is a huge range of makes, models and sizes available in the market. It is very important for you to know exactly which make and model you want to sell. Also, check out the storage capacity of the tablet you are willing to sell. Where To Sell Your Old Tablet? This is a very important question to ask. And to be honest the best place to sell your old tablet is a trusted and authentic online marketplace. Now you must be wondering, that why we are sharing such an answer with you, despite the fact that you can easily sell your tablet by simply going to your nearest supermarket. Well, there is no doubt that you can sell your old slate wherever you want, but to sell it online is the best solution for your old, not-in-use tablet. Selling online your old device has lots of benefits. If you sell your tablet at an online marketplace then you will get maximum cash for sure. Your payment will be 100% secure and guaranteed. There is no risk involved in selling your old gadget online. You can even sell your broken and damaged tablet online without leaving your couch. Speaking of online marketplaces, our top pick is SellTheMobile. SellTheMobile is one of the UK’s top online mobile phone and tablet recycling comparison websites. You can sell and even recycle tablet at SellTheMobile without worrying about anything else. At SellTheMobile you can compare offers for your tablet from different recyclers. SellTheMobile has partnered with the best mobile phone and tablet recyclers in the UK to provide you best and top deals for your old, used device. These recyclers are the leading mobile phone and tablet buyers, who work solely with SellTheMobile. SellTheMobile aims to provide you with the best price for your used/broken tablet with the highest level of customer service. SellTheMobile has made the process of selling your tablet faster and convenient. Selling your old, broken, damaged tablet online at SellTheMobile requires you to follow just four simple steps. How To Sell Your Tablet At SellTheMobile And Get Best Price For It? As we have mentioned above, there are a few simple steps you have to follow to sell your old slate at SellTheMobile. Let’s discuss these steps one by one. When you open the homepage of SellTheMobile, you will see a search box right in the middle of the page. Click on the empty space in the search box and type the exact model of your tablet in the bar. Select the specifications of your device. Moreover, when you enter your device’s make and model, and if it’s one of the most searched items on the site, the search bar automatically shows the device model and details. If you are browsing the site through a desktop then click on your device’s name and if you are visiting the site through your smartphone, then tap on your tablet’s name and model. You will be redirected to the next page. On the next page, you will see a list of the best price quotes offered by various recycling platforms. From the left side of the window, select the physical and network conditions of your tablet. After that, select the deal that suits you best and click ‘Sell Now’. Before placing your order, it is recommended to visit the recycler’s website. Though it is not a mandatory step to follow but this will keep you at least good peace of mind. By visiting the site, you will be able to know about the recycler and how it works. And don’t forget to check out the recycler’s ‘Terms & Conditions’ page. After visiting the recycler’s website, come back to the SellTheMobile page and click or tap on ‘Sell Now’ button. You will be redirected to the next page to complete your order. Check out the instructions and fill out the form according to the guidelines to place your order. Enter your personal information as per the requirements of the website. After filling out the required details, click ‘Complete the Sale’ button. If you need any help while placing your order, feel free to contact SellTheMobile via live chat or email. Once your sale process is complete the recycler will send you a free postage pack at your given address. All instructions will be included in the pack. Just follow them and send your tablet to the recycler free of cost. Now just sit back and wait for your payment. As soon as the recycler receives your tablet, you will get paid immediately. It’s another question that you should know about. Please note that mode of the payment varies from recycler to recycle. But most of the times, the customer receives his/her payment via Cheque or Bank transfer. To get an idea about the mode of the payment, it is advised to visit ‘payment method’ column of that particular recycler’s website. Please keep in mind that SellTheMobile is a platform that offers price comparisons for your tablet from many recycling companies. Once you selected a recycler company and accepted its offer, then you should deal directly with that company. These recycling companies offer excellent customer support so you should not hesitate to contact them directly. As you have learned that selling your tablet at SellTheMobile is as easy as it can be. 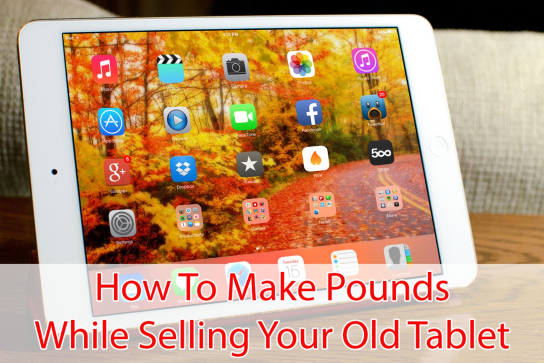 So without looking anywhere else, pull out your old tablet from your closet, prepare it and sell it online at SellTheMobile.com and earn handsome amount of pounds.